Suzan Puhl Murphy joined the Finance Department faculty at The University of Tennessee in 1996. As Distinguished Lecturer, she teaches Financial Management (Finance 301) and Money Matters & More (BA202). She also teaches in the MBA program. 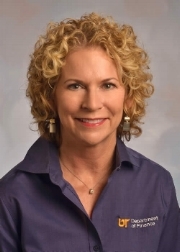 Mrs. Murphy's professional experience includes teaching business and mathematics and working as a Certified Management Consultant with two international public accounting firms. She holds the MBA degree from Loyola University and the BS degree from The University of New Mexico. In addition, she has completed graduate work in mathematics at The University of Tennessee. Honors include: Leadership Knoxville Class of 2008, Recipient of the Haslam College of Business Outstanding Commitment to Students Award 2007 and 2013, Recipient of the Order of Omega, Faculty Member Award, 2007, Recipient of the Alumni Outstanding Teaching Award, National Alumni Association 2002, Recipient of the University of Tennessee Citation for Excellence in Teaching for Instructors 2000, Recipient of the Allen H. Keally Award for Assistant Professors, Instructors or Lecturers in the College of Business 1999, Recipient of the Chancellor’s Award for Excellence in Advising 1999, Recipient of the College of Business Administration Undergraduate Faculty Advising Award 1998, Recipient of the Sigma Alpha Epsilon TN Kappa Chapter, Teacher of the Year Award 1998.